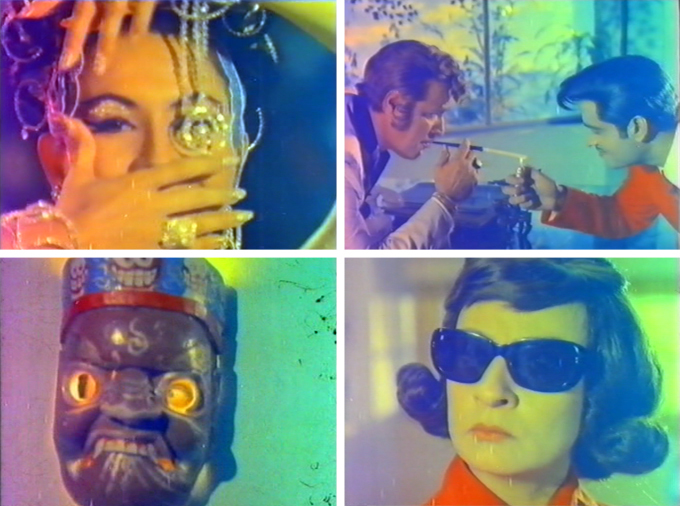 Lord I love Indian spy films from the 1960s, but make no mistake about it: this is a bad movie. Since I expected that going in, I was not disappointed, and in fact was delighted to find a decent level of (possibly inadvertent) hilarity. I will share those gems here so that you can give the painfully awkward and sparkless Biswajeet/Saira Banu pairing, the boring songs, and the disaster that is the plot(s), a miss. I am a pretty big fan of director-producer-writer-actor Arjun Hingorani’s work. His listing on imdb is probably incomplete, but the films he made that I’ve seen (four of them now), I have really enjoyed despite some issues. 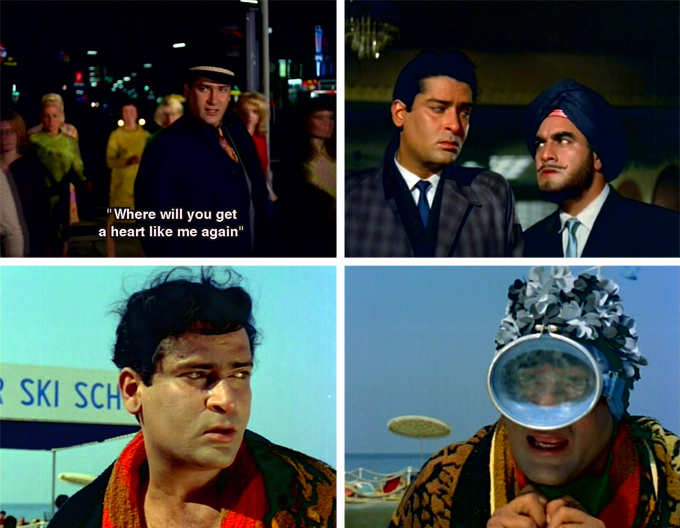 Those issues are very small in the face of his laboriously tangled—but coherent—storylines, stylish camera work, fabulous music, and the people he loves to cast: Dharmendra, Ashoo, Hiralal, Shetty, Jankidas, Keshav Rana and more. I also appreciate his penchant for casting himself in his films, not always in a heroic light but always in a terrible wig. In essence, his movies are solidly entertaining and a real delight to sit through if you are willing to overlook a certain glossing-over of logic and moderate level of preachy melodrama (which I am). I have no idea what the plot of this movie is—seriously no idea—but I know that I love it. Even if with subtitles it became a maudlin, sexist melodrama (which I doubt) I would still love it. Why? Well for one thing it is extremely shiny. Premnath has a lair made completely out of mirrors, and not in a pretty Mughal-e-Azam kind of way but in a spectacularly gaudy disco kind of way. The songs by OP Nayyar are delightful and the cinematography (VN Reddy) is gorgeous. The cast is a veritable Who’s Who of character actors. And a still-dashing Sunil Dutt makes a dacoit I can really root for, although he does seem a little old for plump young Rekha. The story is liberally sprinkled with dacoit-drama masala ingredients: greedy moneylenders, long-lost daughters, flashbacks, dozens of people named Singh, pretty pretty Marwari horses, and real ruffians lurking beneath a veneer of respectability and draped with scantily-clad gori extras. I felt totally sated by the end. Did I mention the mirrors? Lots and lots of mirrors. This film is exactly why I feel blessed to have discovered Hindi cinema. As Beth said in her review of it this summer, I live in fear of running out of movies like this. Elaan is more fun than anyone ought to be allowed to have, and if it had subtitles my head would probably explode (but please, somebody, subtitle it anyway). The lunatic story (featuring a ring of invisibility that only works when you put it in your mouth) is presented with great relish and plenty of style, and manages to stay on track and is nicely paced. Even the flaws only add to its charms. And all this is embellished with the finest fashions and set decoration the Seventies had to offer! This film is exactly what I would picture a big long LSD trip to be like (because of course I have no actual knowledge of one). Although if it were an acid trip, I’d probably be dead now. It is that crazy: I have a pretty high tolerance—some less charitable might even say need—for eye-popping candy-colored visuals, but by the abrupt (and non-existent) end of this my head was exploding. Truly it is a dizzying kaleidoscopic bombardment of Cracktastic that never lets up. Low on budget it might be, but the heights of jugad are certainly scaled. I also really love the cinematography (Shyam Shiposkar): the camera angles are fantastic. Much of the candy color is probably a result of film deterioration, but here that sad state only adds to the charm. Here we have another formulaic daku-drama, by which I mean I loved it. So many throbbing neck veins (Dharmendra, Vinod Khanna, Ajit)! So many ferocious eyeball-to-eyeball staredowns! So many lines spat out through clenched jaws—and Prem Chopra nowhere in sight! So many manly men named Singh! It is chock-full of Man Candy; pretty, pretty horses; the usual assortment of terrible wigs that do nobody any favors; men in hoop earrings; and that love which passeth all understanding—the unconditional bhai-bhai rishtaa. Hema Malini provides the Woman Candy and is the feisty catalyst for the eventual showdown between brothers and rivals. Plus, wonderful music from Kalyanji Anandji, including some funked-up title music! This is one of those films I watched early on and I will admit that it confused me hopelessly at the time. I did not understand the wigs, or Dharmendra’s facial tics and popping veins, or why Tariq was so manic. I was so ignorant and naive. Now of course, although I still have questions, I know they can never be adequately answered. 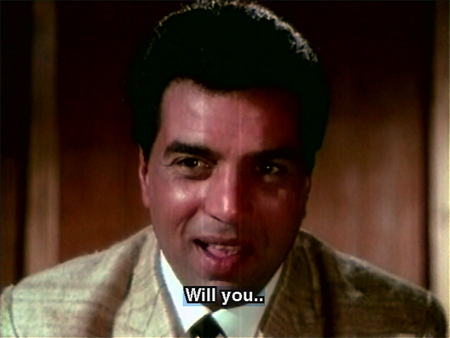 Why yes, Dharamji, I will. I don’t even care what you want me to do. I don’t know what it is about him, but for me watching a Dharmendra starrer is like getting a big warm hug. He is just so…comforting and solid, somehow (it’s no wonder he’s my fake-pretend bodyguard). So on a recent snowy night, missing my Dad and needing a sustaining presence, I rewatched Yakeen, one of my early favorite forays into 1960s Hindi cinema. It must be universally acknowledged that two Dharmendras are always better than one, even if one of them has blue eyes and orange hair.